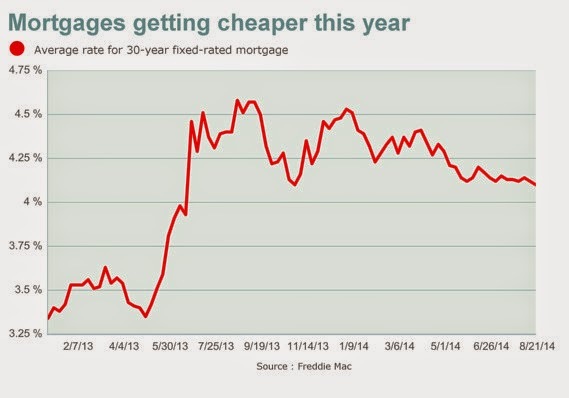 Mortgage rates in the U.S. dropped for a second week, sending 30-year borrowing costs to the lowest point for 2014. The average rate for a 30-year fixed mortgage was 4.1%, down from 4.12%, Freddie Mac said in a statement today. The average 15-year rate slipped to 3.23% from 3.24%, according to the McLean, Va.-based mortgage-finance company. The 30-year rate was last this low at the end of October. It has declined from a two-year high of 4.58% last August, helping support home demand. Previously owned houses sold at an annualized rate of 5.15 million in July, up 2.4% from the previous month and the most since September, the National Association of Realtors said today. "The longer rates are down at these levels, the more activity we're going to get," Mark Vitner, senior economist at Wells Fargo Securities LLC in Charlotte, N.C., said in an interview before the data were released. "They're helping in some way, but that activity may be less than hoped for." Last month's sales pace was down 4.3% from July 2013, figures from the Realtors group show.